Meguiars Flagship Hydro-Shield Detailer is used to quickly get rid of dirt, grime, water spots and other fresh contaminants and give your boat a deep gloss, lasting polymer protection at the same time. 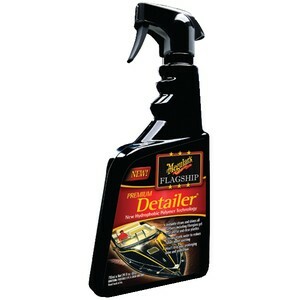 Meguiars Flagship Hydro-Shield Detailer is used to quickly get rid of dirt, grime, water spots and other fresh contaminants and give your boat a deep gloss, lasting polymer protection at the same time. The best part is it's formulated to be used on all surfaces of your boat, including the gel coat, metal, and clear plastics. Give your boat that "just washed" appearance with this specialized detailer hydrophobic polymer technology and reduce drying time and water spot etching at the same time. Cleaning your boat was never this easy.